Tag us & tell us about your experience. Coffee here is soooo good. Coffee is dark, warm, full bodied and excellent start to an early surf day. I would recommend grabbing yourself a bag of dark and stormy as well. It's not just coffee. It's a lifestyle. We are a small roastery and café located in Tofino, British Columbia. Sourcing ethically grown or organic green bean from select coffee growing regions. Roasting in small batches daily to ensure the freshest coffee drinking experience. 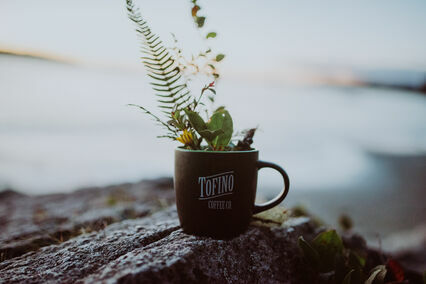 You can visit us at our café at 605-112 Gibson Street, Tofino where our talented barista team prepares and serves batch brew, espresso based beverages and light pastries. Our roastery is located at 681 Industrial Way, this is our workspace and creative zone.